Cargo Area: 213 in. x 94 in. Our Express Vans can pick up or deliver at a variety of dock heights with our unique lift gates. Huge platforms specifically customized for iCAP. We can lift up to 1600 lbs. from over 50 inches hight to ground level. No floating dock, no scissor lift, low dock or no dock - no problem! We have the answer for all your delivery needs. iCAP officially incorporated in 1997 but our delivery experience extends further back. In 1987 Joseph Paci began delivering newspapers to post offices, vendors, and residents for his brothers' weekly newspaper, Neighbor News in Denville N.J. Joe was responsible for the entire back end of the newspaper business, which included liaison to the printer, inserting and mailing. Eventually iCAP became a stand-alone company with additional newspaper accounts and was incorporated in Morris County N.J.. 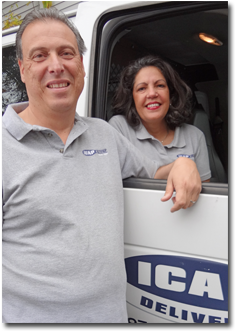 Since then iCAP has expanded its delivery service to include many newspapers and print media as well as commercial accounts throughout the tri-state area. Today we work with manufacturers to deliver their products from point to point within northern New Jersey and to the bordering states. Our short haul freight fleet is very versatile. We can carry multiple pallets weighing thousands of pounds to boxes weighing 20 pounds as well as deliver a package on the same day. We specifically serve northern New Jersey and in many cases we are only a short distance from your place of business. We provide fast reliable service at an affordable price. Call us to become your delivery company and we can save you time and money.